Compared to most other football powerhouses, Paris Saint-Germain (PSG) are a relatively young club. Nevertheless, they were remarkably successful in their short lifespan, winning five Ligue 1 titles, nine French Cups and five League Cups. They are one of only two French sides to win a European trophy, a feat they have achieved by winning the 1996 Cup Winners' Cup. Their rivalry with Marseille, often referred to as "Le Classique", is widely considered to be the most passionate derby in French football. Celebrating the victory in Ligue 1 season 2014-15. Not surprisingly, PSG immediately drew sympathies of the Parisian crowd, which was exalted to finally have a club that could contend for domestic trophies. Shortly after earning promotion to Ligue 1 in 1972, the club moved into the legendary Parc des Princes, which would serve as their home to this day. The early 80s saw PSG win their first major trophies by claiming back-to-back French Cups in 1982 and 1983. This naturally led to the club winning their first Ligue 1 title in 1986 and consequently trying their luck in European competitions, where they played a number of memorable matches but ultimately failed to advance past the quarter-final. It was during this period that PSG developed a penchant for attacking-minded football, which would play a large part in the club becoming fan favorites, both in France and abroad. Following the takeover by Canal+ in 1991, the club's future was destined for greatness. With the new owners investing large sums of money into big-name signings such as George Weah and Raí, PSG quickly developed into one of the most dominant clubs in the country. In addition to claiming their second Ligue 1 trophy (1994), three French Cups (1993, 1995, 1998) and two League Cups (1995, 1998), PSG became the second French club to win a European trophy by defeating Rapid Wien in the 1996 Cup Winners' Cup final. These golden years were followed up with a period of decline due to severe mismanagement and cracking under pressure in the title races. Even though the club had some Cup success during the 00s – including three French Cups and a League Cup – this period is mostly remembered for numerous crisis situations and problems with hooliganism. Their fortunes took a turn for the better after the club was bought by Qatar Sports Investments in 2011. 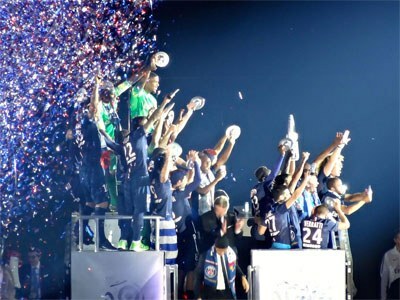 Led by their new star, Zlatan Ibrahimović, PSG returned to the spotlight by winning three consecutive Ligue 1 titles from 2013 to 2015. They also added to their trophy collection by claiming another French Cup in 2015 and two more League Cups in 2014 and 2015. In 2017, a new world record transferred was made when the Brazilian star Neymar was bought from Barcelona for a €222 million fee. The PSG logo includes a stylized drawing of the Eiffel Tower. The Eiffel Tower have been part of the crest since 1972, but the design has going through some slighter changes (in the years 1992-1996, it was left out completely from the logo). Below the Eiffel Tower symbol, a smaller fleur de lys symbol can be found. 1904 Stade Saint-Germain, that later would merge with Paris FC into PSG, is established. 1969 Paris FC, that later would merge with Stade Saint-Germain into PSG, is established. 1970 The club is established. 1972 Paris FC split from PSG. 1973 Moving to Parc des Princes. 1974 First season in Ligue 1. 1982 Winning its first Coupe de France. 1986 First time Ligue 1 champions. 1996 First Cup Winners' Cup victory. 2011 The company Qatar Sports Investments become the new club owner. 2016 PGS collects 96 points during the 15-16 season, a new league record. 2017 Neymar become the first player transferred to a club for a fee over €200 million (€222M).